CROP POP 9-24-4 is manufactured by combining anhydrous ammonia, urea, phosphoric acid, and potassium hydroxide, Potassium Sulfite, Boric Acid, Zinc Chloride, EDTA MN, utlizing CEC™ Propulsion Delivery System. It can be applied to most vegetable and field crops, deciduous fruit and nut trees, grapes, olives and citrus. 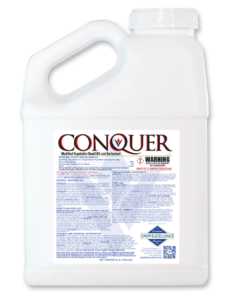 It may be used for foliar or soil applications or applied through a drip system. CROP POP 9-24-4 works well as a foliar spray on most crops. It has high orthophosphate content. 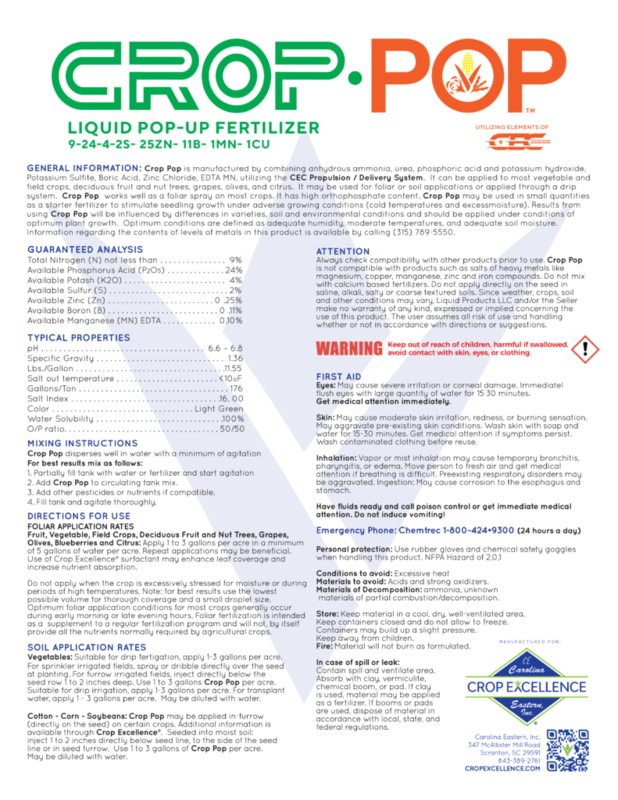 CROP POP 9-24-4 may be used in small quantities as a starter fertilizer to stimulate seeding growth under adverse growing conditions (cold temperatures and excess moisture). Results from using CROP POP 9-24-4 will be influenced by differences in varieties, soil and environmental conditions and should be applied under conditions of optimum plant growth. Optimum conditions are defined as adequate humidity, moderate temperatures and adequate soil moisture. Fruit, Vegetable, Field Crops, Deciduous Fruit and Nut Trees, Grapes, Olives, Blueberries and Citrus. Apply 1 to 3 gallons per acre in a minimum of 5 gallons of water per acre. Repeat applications may be beneficial. 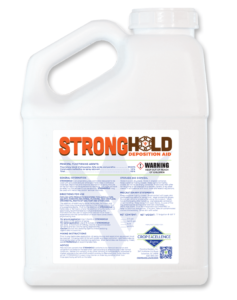 Use of a surfactant may enhance leaf coverage and increase nutrient absorption. Do not apply when the crop is excessively stressed for moisture or during periods of high temperatures. Note: for best results use the lowest possible volume for thorough coverage and a small droplet size. 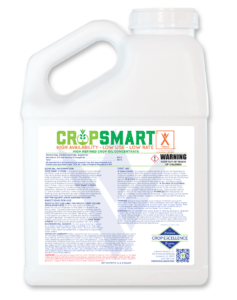 Optimum foliar application conditions for most crops generally occur during early morning or late evening hours. Foliar fertilization is intended as a supplement to a regular fertilization program and will not, by itself provide all the nutrients normally required by agricultural crops. Vegetables: For sprinkler irrigated fields, spray or dribble directly over the seed at planting. For furrow irrigated fields, inject directly below the seed row 1-2 inches deep. Use 2 to 4 gallons of CROP POP 9-24-4 per acre. May be diluted with water. Cotton – Corn – Melons and all other crops seeded into moist soil: Inject 1 inch to 2 inches directly below or to the side of the seed line. Use 3 to 8 gallons of CROP POP 9-24-4 per acre. May be diluted with water. CROP POP 9-24-4 may be seed row (directly on the seed) applied on certain crops.